Optomap System - The Birth of Dilation-Free Exams! At Teagle Optometry, the most important thing we do is examine eyes. This should always include a careful examination of the exterior and interior eye. As we experience daily, how clear a person sees is not the sole determining factor of eye health. In fact, many unhealthy eyes still display 20/20 vision, and have no other definable symptom. In other words, a person can have significant eye disease and not even know it is there, and without looking neither will your doctor. Unfortunately, these conditions are all to often missed on routine eye examinations due to the fact that the eye was assumed to be healthy based solely on the clarity of a persons vision. Therefore, it is a requirement that an eye examination include a complete view of the inner eye for every person, every year, regardless of age. 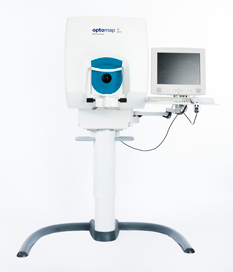 To make this an easy and painless process, allow us to introduce the Optomap Retinal Imaging System. With the Optomap, the patient and doctor can instantaneously view the entire inner eye. The results are reviewed by you and your doctor during your eye exam, and are kept for reference and comparison at future eye exams. Our newest Optomap has enhanced capabilities, including better resolution, a wider field of coverage, and 3D imaging. We have found this to be the most valuable technology every introduced to primary eye care. Gone are the need for dilating drops and their side effects of sustained blurry vision after your eye exam. We get the results we need, you leave with the same vision you came in with.